The insufficiency of our nation’s education and training system is clear. While policymakers and educators have often encouraged young Americans to obtain a bachelor’s degree, too many young people now believe that a four-year degree is the only way to achieve economic mobility. However, less than half of those who aim to earn a bachelor’s degree end up completing one. Those who do complete a four-year degree often do so only after taking out crushing levels of student debt. Worse yet, those who fail to earn a bachelor’s are too often left with the burden of student debt without the benefit of a degree. At the same time, business executives and economists alike are sounding the alarm that the United States is not producing sufficient numbers of skilled workers to meet employer demand. According to the Georgetown University Center on Education and the Workforce, by 2020, the United States will be short 5 million workers with the necessary technical certificates and credentials to succeed in high-growth, high-demand industries. Apprenticeship is a worker-training model that has been shown to raise workers’ wages, increase employee productivity, and improve employers’ bottom lines. 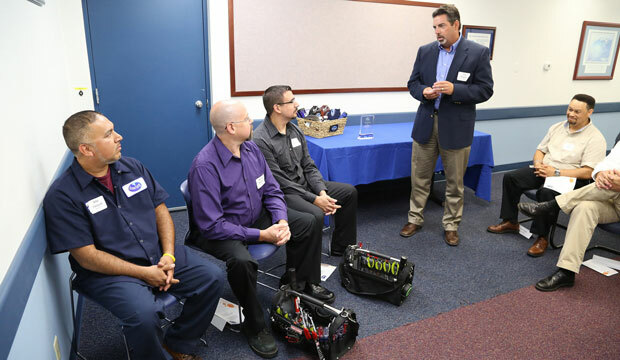 An apprentice is a paid employee who receives formal on-the-job training and classroom-based instruction leading to a nationally recognized credential. Because apprentices are paid to learn, they need not forgo employment income in order to pursue education and training. Just as importantly, apprentices gain an education while incurring little or no debt. For their part, employers gain a pipeline of skilled workers who have been shown to increase productivity and boost the bottom line. The full source for this figure is available at the bottom of this column. The figure above shows the actual number of apprenticeship starts—the number of individuals who entered an apprenticeship program during a specific year—each country had in 2012 and how many apprenticeship starts the United States would have had in that year if it had as many apprentices per capita as each of the other five countries. 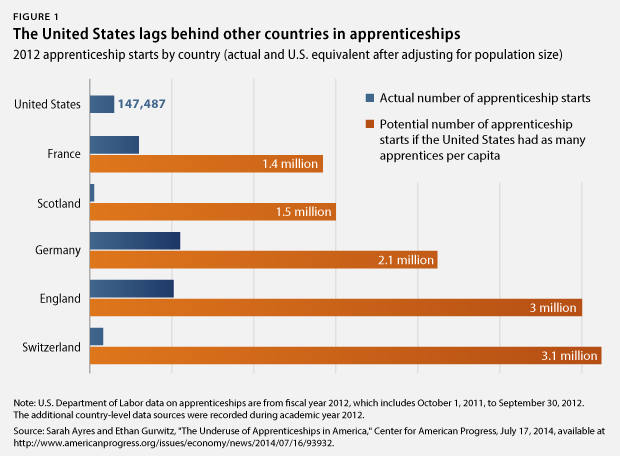 The United States had fewer new apprentices per capita than any of the other five countries. With more than 147,000 apprenticeship starts, the United States had less than one-third as many starts as England, despite having a population about six times as large. Moreover, if the United States had as many apprenticeship starts per capita as Germany, there would have been more than 2 million new American apprentices in 2012—about 14 times as many as actually started programs that year. With a projected shortage of 5 million skilled workers by 2020, an expanded apprenticeship system would clearly go a long way toward filling the gap. One promising development on this front is President Barack Obama’s recent announcement of a new $100 million grant program to support the development of innovative apprenticeship programs across the country. The president has also called for $2 billion to double the number of apprentices in the United States over the next five years. In Congress, Sens. Cory Booker (D-NJ) and Tim Scott (R-SC) have introduced legislation that would implement CAP’s recommendation of a $1,000 tax credit for companies that sponsor apprentices. We applaud these moves and encourage policymakers to pursue additional measures to promote apprenticeships in the United States. A rapid expansion of apprenticeships can help meet the demand for skilled workers and create new opportunities for America’s young people. Sarah Ayres is a Policy Analyst on the Economic Policy team at the Center for American Progress. Ethan Gurwitz is a Research Assistant with the Economic Policy team at the Center. Figure sources: Index Mundi, “Historical Data Graphs,” available at http://www.indexmundi.com/g/ (last accessed July 2014); Office of National Statistics, “Annual Mid-year Population Estimates, 2011 and 2012” (2013), available at http://www.ons.gov.uk/ons/rel/pop-estimate/population-estimates-for-uk–england-and-wales–scotland-and-northern-ireland/mid-2011-and-mid-2012/stb—mid-2011—mid-2012-uk-population-estimates.html; U.S. Department of Labor, Employment and Training Administration, “Data and Statistics,” National Registered Apprenticeship Results, available at http://www.doleta.gov/oa/data_statistics2012.cfm (last accessed July 2014); Skills Development Scotland, “Modern Apprenticeship Programme, 2000-01 to 2012-13: Total MA Starts” (2013), available at http://www.skillsdevelopmentscotland.co.uk/media/881080/ma_starts_since_2000-01.pdf (last accessed July 2014); U.K. Skills Funding Agency and Department for Business, Innovation and Skills, “Breakdown by geography, equality & diversity and sector subject area: starts 2002/03 to 2012/13,” available at https://www.gov.uk/government/statistical-data-sets/fe-data-library-apprenticeships–2 (last accessed July 2014); G20 2014, Organisation for Economic Co-Operation and Development, and European Commission, “Country Information on Apprenticeships: Country responses” (2014), available at http://www.oecd.org/els/emp/Youth%20questionnaire%20country%20responses-Compilation1.pdf; French Ministère du Travail, “Les entrées en contrat d’apprentissage” (2013), available at http://travail-emploi.gouv.fr/IMG/xls/Elements_caracteristiques_des_entrees_enregistrees_-_annees_2009_a_2013-2.xls; Statistisches Bundesamt, “Bildung und Kultur: Berufliche Bildung” (2012), p. 22, available at https://www.destatis.de/DE/Publikationen/Thematisch/BildungForschungKultur/BeruflicheBildung/BeruflicheBildung2110300127004.pdf?__blob=publicationFile.